Barrix Catch fruit Fly Trap This product is a pest fly trap, which should be used with pheromones lure to attract and trap pests of the Bactrocera cucurbitae species of 226 sub species (commonly known as Melon Fly), which is a major pest of high risk which causes pre-harvest damages, and this pest cannot be controlled by any pesticide. 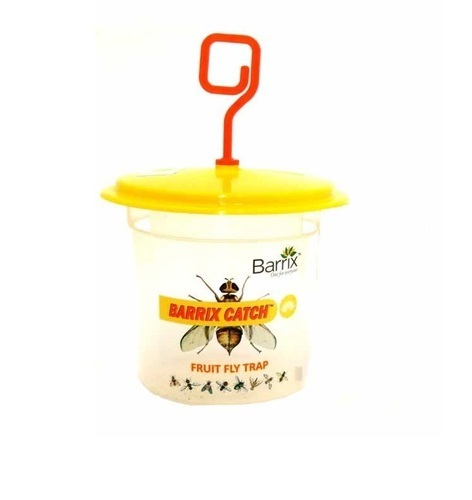 Container can hold 5400 Dead flies.We recommend farmers to use Barrix Catch fruit Fly trap along with Barrix Catch fruit Fly Lure while cultivating following crops:Fruits: Lemon, Orange, Jack Fruit, Passion fruit, Indian Almond, Kiwi fruits, Melons like Water Melon, Musk Melon, Pear Melon. Vegetables: Pumpkin, Cucumber, Chayote, Chillies, Capsicum, Tomato, Brinjal.Gourds like Bottle gourd, Ivy gourd, Bitter gourd, Snake gourd, Ash / White gourd, Gooseberry gourd (gherkins), Ribbed gourd, Sponge gourd, Peas like French Beans, Green Beans, Indian Peas, Pigeon peas.Commercial crops: Sun Flower, Maize.